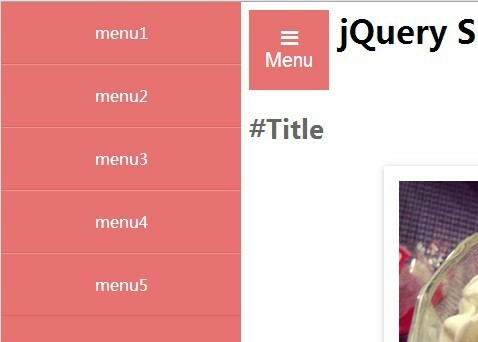 All the Free jQuery Plugins about 'push menu' are listed here. A modern, responsive, mobile-friendly, multi-level sidebar push navigation system designed for dashboard & admin panel, built with jQuery, Bootstrap 4 and Font Awesome. 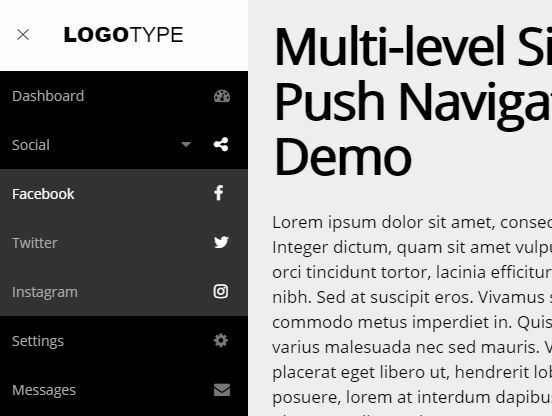 A jQuery off-canvas navigation plugin which lets you create fully accessible sidebar or top/bottom sliding panels with keyboard interactions and ARIA attributes. HC MobileNav is a jQuery plugin for creating multi-level, mobile-first, off-canvas side navigation that supports endless nesting of submenu elements. 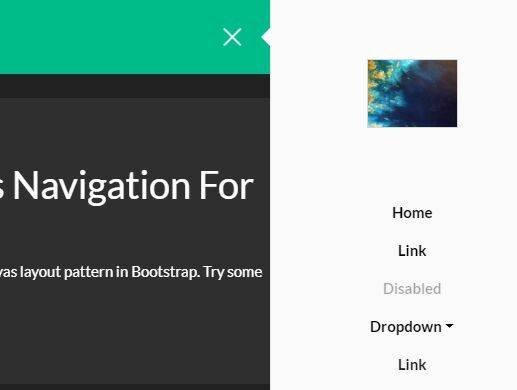 This is a collection of 5 examples/templates showing how to create responsive, mobile-friendly sidebar navigation using jQuery, CSS/CSS3, and Bootstrap 4 or Bootstrap 3 framework. 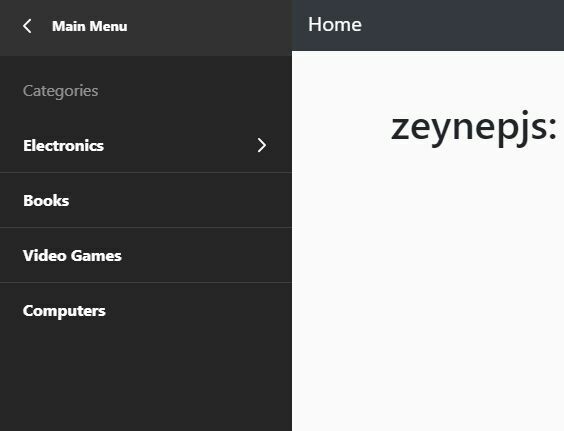 The jQuery zeynepjs plugin lets you create a multi-level off-canvas push menu from nested HTML lists for your mobile-first web app. SwipeNav is a mobile-friendly jQuery site navigation plugin which reveals an off-screen push menu with touch swipe events or by clicking on the hamburger toggle button. 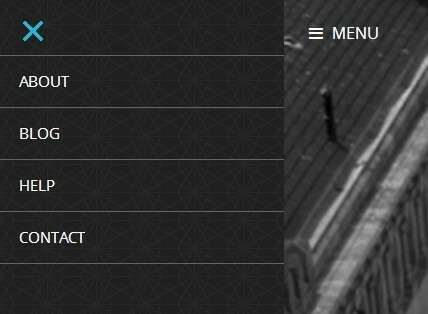 Yet another jQuery/CSS based push menu that enables a hamburger button to reveal an off-screen sidebar navigation while pushing the main content to the other side. A jQuery & CSS based, multi-level, app-like revealing menu & sidebar navigation system especially suitable for dashboard & admin panel. 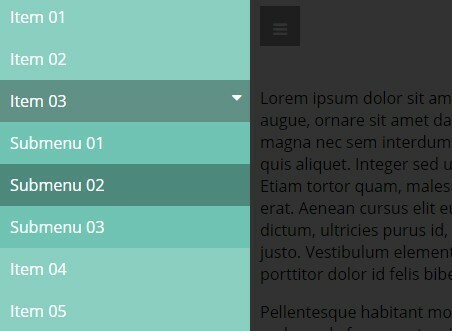 Hiraku is a lightweight yet powerful jQuery plugin used to create off-canvas drawer navigation menu that supports both left and right sides. A mobile-friendly off-canvas push menu (sidebar navigation) that uses HTML5 local storage to preserve the menu open/close stats on your next visit. 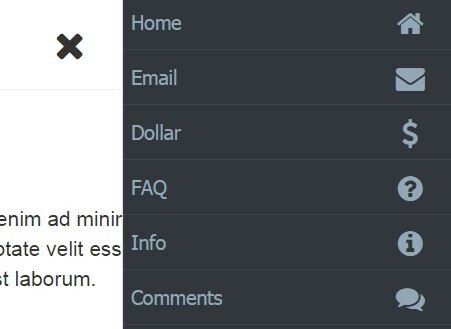 A flexible and cross-browser jQuery side menu plugin for creating a side navigation menu with multi-level functionality that allows endless nesting of navigation elements. 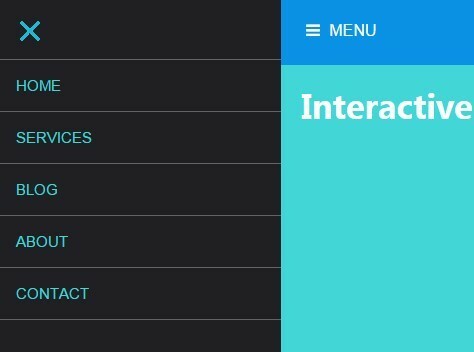 uNav is a jQuery responsive menu plugin that automatically transforms the regular dropdown menu into a push menu with off-canvas style on mobile and tablet devices. 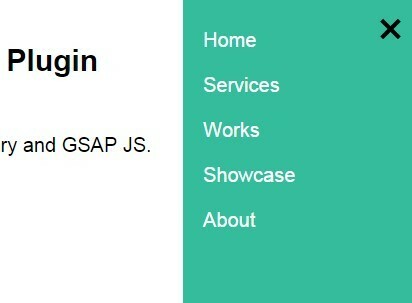 menuUI is a jQuery plugin for generating a side off-canvas push navigation for your Bootstrap webpage using JSON objects. 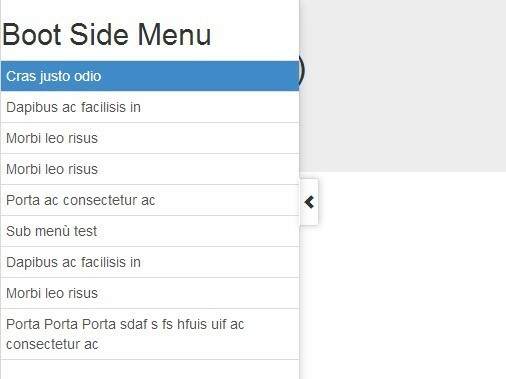 side-menu.js is a lightweight, mobile-first jQuery side navigation plugin which lets you create a native app style multi-level push menu for your mobile webpages. slideNav is a mobile-friendly side drawer plugin for easily creating off-canvas push menus, navigations, and any other panel types. This is a lightweight jQuery plugin that transforms the regular Bootstrap nav component into a mobile-friendly, off-canvas push menu on small screen devices (smaller than 767px). 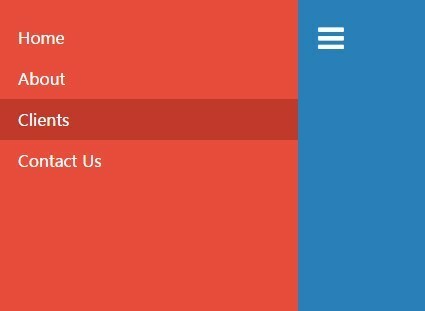 Push.js is a lightweight jQuery plugin which adds left or right off-canvas sidebar push menus to your Bootstrap projects. 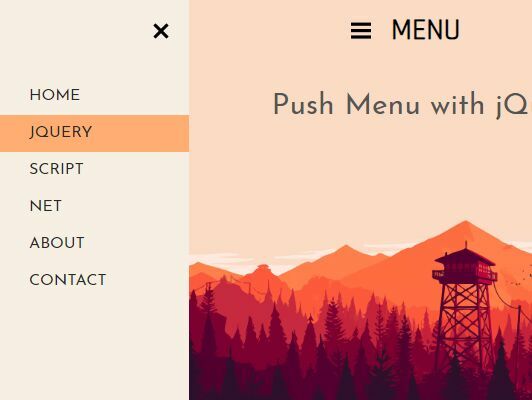 Pushy is a mobile-friendly jQuery navigation plugin which lets you create responsive push and/or overlay sidebar menus using CSS transforms and transitions. 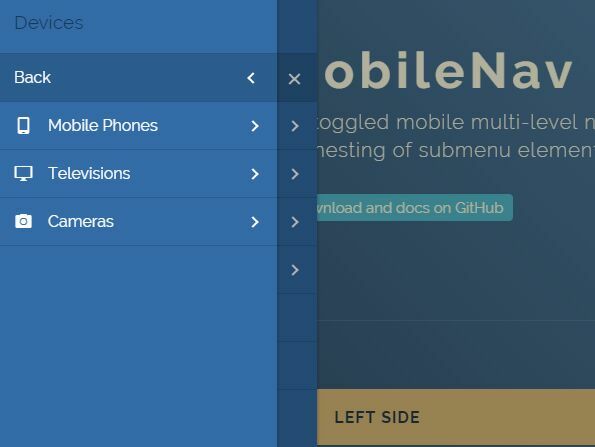 sliiide2 is a really small jQuery plugin that provides a simple way to create App-style sliding navigation menu for your website / web application. amburgerMenu is a jQuery plugin that helps you to create a mobile-friendly push navigation menu with a sticky hamburger toggle. Just another jQuery mobile app style navigation system that slides the centered main content left or right to reveal a hidden off-canvas menu when triggered. Yet another mobile-friendly navigation system that allows your users to toggle a vertical off-screen navigation menu while push the main content from left to right. 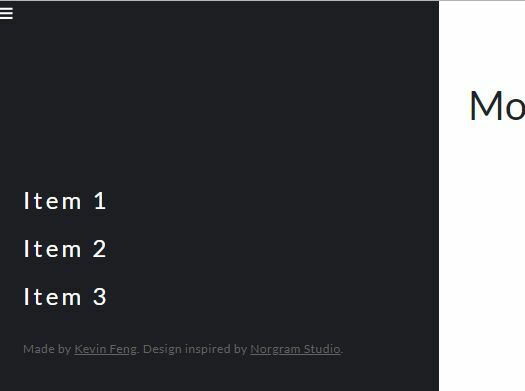 A jQuery/CSS3 based responsive, off-canvas navigation where the sidebar menu is displayed by sliding the entire page to the left (or right) side when toggled. 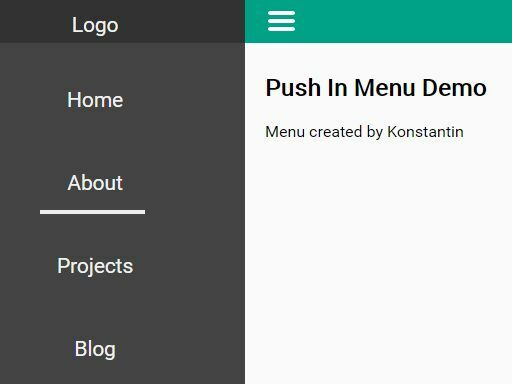 pushMenu is a jQuery plugin used to create an App-style multilevel push menu for your web project. 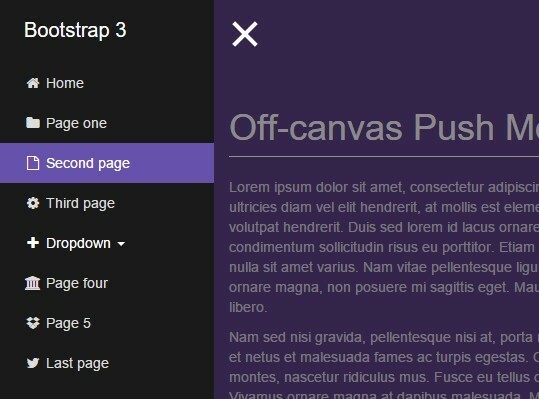 An ultra-light jQuery extension for Bootstrap that helps you create an user-friendly off-canvas push menu from the default Bootstrap navbar component in mobile view. 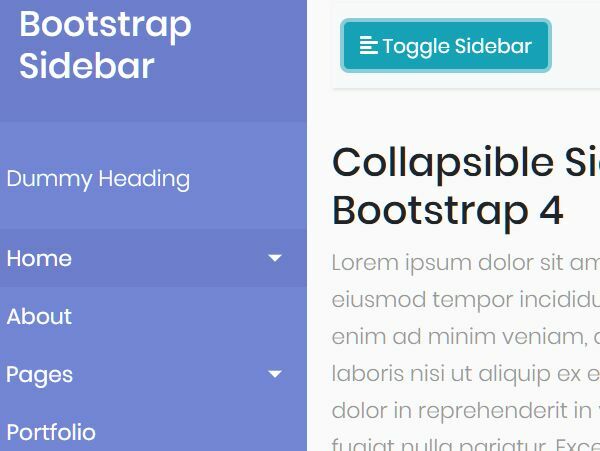 Simple SideBar is a jQuery plugin for creating responsive, animated, left & right sidebars that can be used for mobile app-style off-canvas navigation, sliding menu, toggle navigation menu, and more. bs.push.nav is a jQuery extension that converts the default responsive Bootstrap navigation into an off-canvas push menu in mobile view. 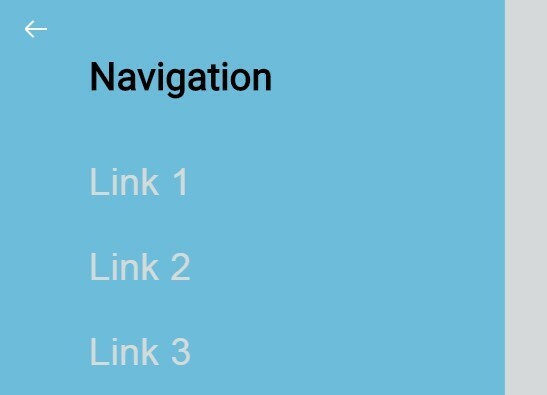 mainNavigation is a simple, lightweight jQuery plugin for generating a multi-level dropdown menu that automatically collapses into an off-canvas menu in mobile view. A lightweight jQuery plugin that convert the default Bootstrap nav bar component into an off-canvas style push menu in mobile view. navobile is a jQuery plugin that make it easy to create an user-friendly and mobile-friendly navigation menu for responsive website design. panels.js is a lightweight jQuery off-canvas library for implementing mobile app style off-canvas panels, sidebars, push menus and page elements into your web page. Trunk.js is a cross-platform, touch-enabled jQuery responsive menu plugin for creating an mobile app-style off-canvas drawer menu for desktop, tablet and mobile. 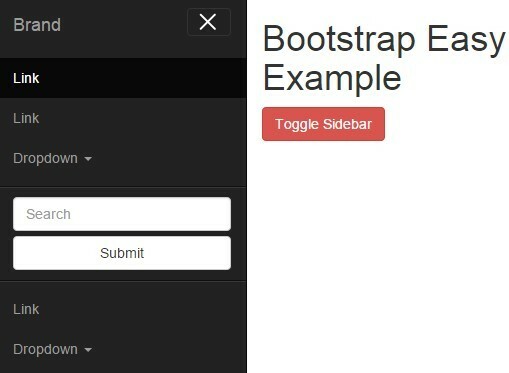 A jQuery & CSS3 based sidebar navigation for Bootstrap 3 that slides out an off-canvas push menu from the edge of the browser window. A jQuery & CSS / CSS3 based responsive off-canvas push navigation that comes with a cool gooey transition effect as you resize the browser window. 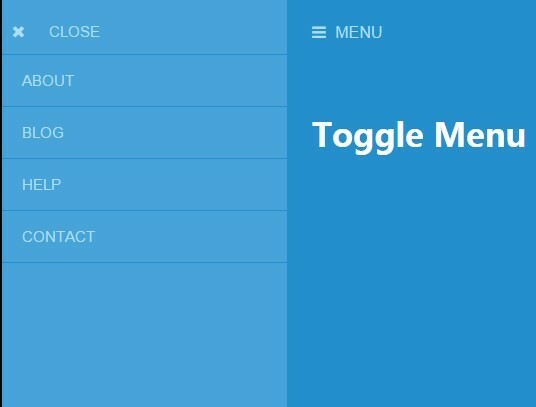 A simple mobile push menu that reveal an off-canvas side menu with a hamburger toggle button, build on top of jQuery and GSAP JS library. 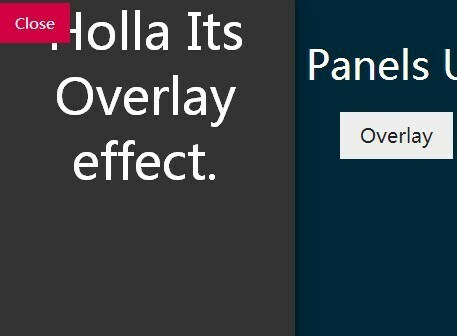 panelslider is a jQuery plugin that makes your sidebars (side panels) slide out from left or right side of the page as well as pushing the main content to the right or left. SecretNav is a jQuery plugin that slides out an off-canvas navigation while pushing the main content away with a fancy CSS3 powered 3D perspective effect. 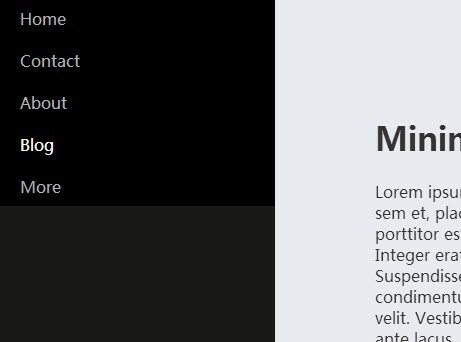 sidemenu.js is a jQuery plugin to create an user- and mobile-friendly push menu that slides out from the left or right hand side of your screen. 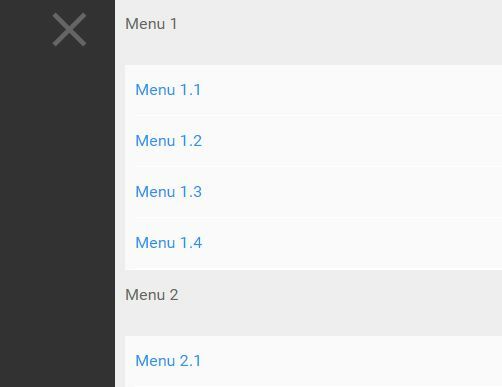 mobTabMenu is a jQuery responsive revealing menu plugin designed for both mobile and desktop websites to make your site navigation more user friendly. 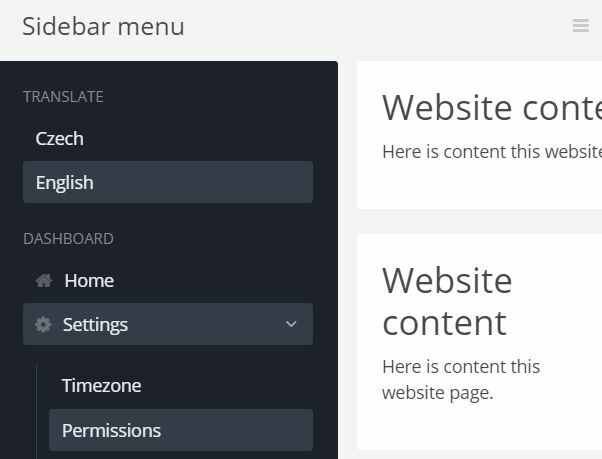 FlyPanels is a jQuery off-canvas navigation plugin which simplifies the task of creating a multi-level, cross-browser, sidebar push menu for your responsive website. 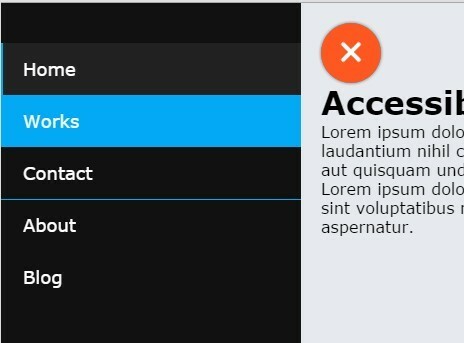 A jQuery and CSS powered responsive multi-level dropdown menu that collapses into an off-canvas push menu on mobile viewport sizes ( less than 767px). 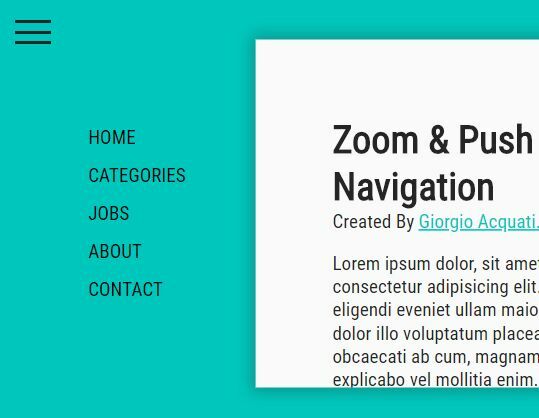 A jQuery & jQuery UI based navigation plugin helps you create an off-screen sidebar push menu with a hamburger toggle for your mobile website / web application. 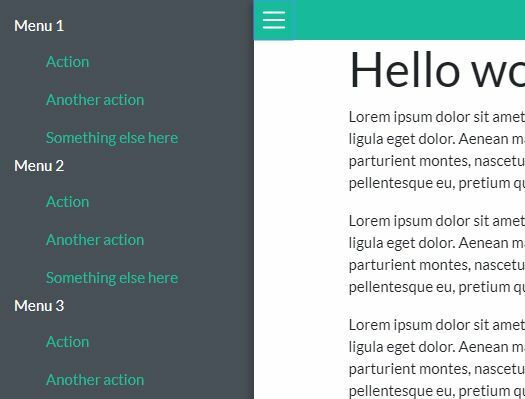 A jQuery & CSS/CSS3 based push menu that reveals a sidebar off-screen navigation from the left side of the window while pushing the main content to the other side. 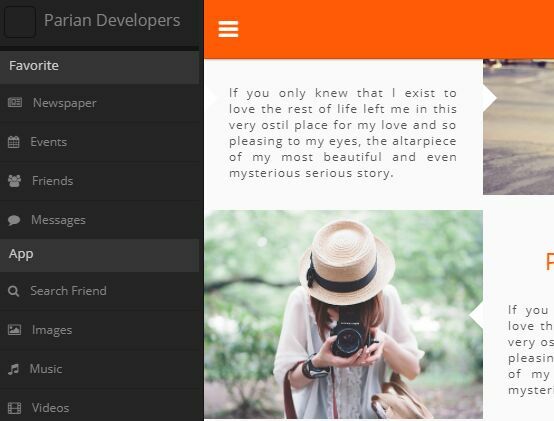 A modern mobile app style navigation solution that makes uses of jQuery and CSS3 to create an off-canvas sidebar push menu with a fancy elastic effect. 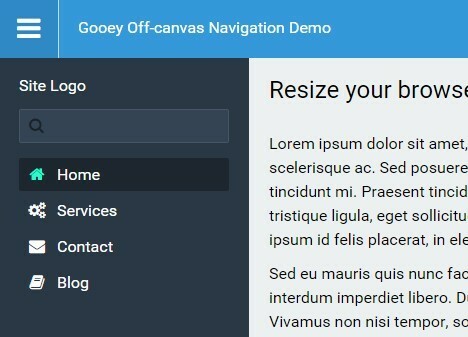 A responsive off-canvas navigation system that uses CSS3 transition to smoothly slide out a sidebar push menu from the right hand side of the web page. An interactive & mobile-friendly sliding menu that pushes the main content to reveal an off-canvas side navigation. 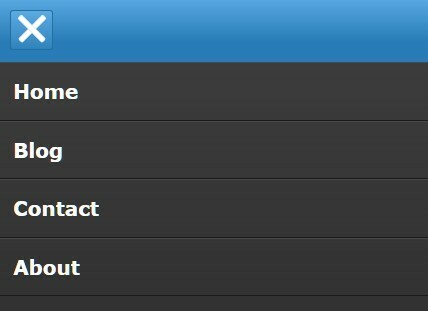 Yet another jQuery & CSS3 based mobile menu template that help you create a sliding off-canvas drawer menu for your mobile website & web application. 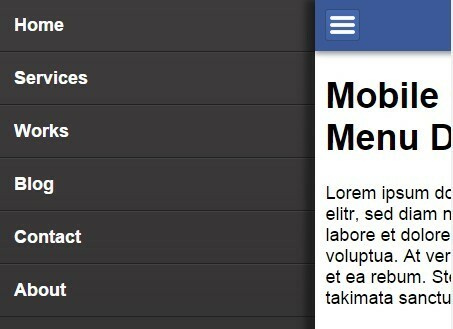 A simple implementation of responsive, mobile-friendly, off-canvas push menu using Html5, CSS3 and a little jQuery magic. 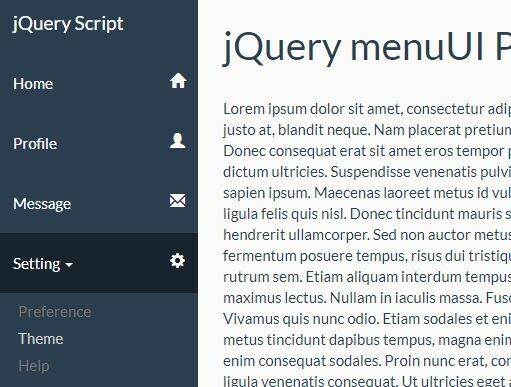 A jQuery off-canvas menu plugin helps you create flexible, mobile-friendly push/overlay menus with support for multi-level navigation elements. 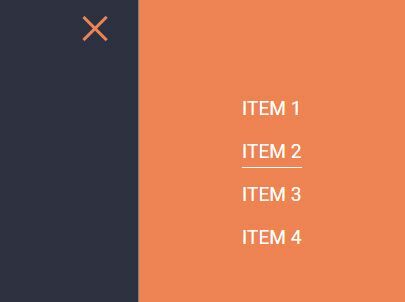 A mobile App style navigation jQuery script that pushes the body to reveal an off-canvas panel menu when you click on the toggle button. A jQuery navigation plugin to create mobile-friendly, app look-alike off-canvas/push/slide/reveal menus with cool CSS3 animations. A jQuery panel-style navigation plugin which makes it easier to create off-canvas push/reveal/overlay menus on your webpage/web app. slideReveal is a jQuery plugin used to creating an off-canvas panel (menu, navigation, sidebar) that slides in and out of the web page when triggered. A simplest way to create a familiar off-canvas menu that pushes the entire site to the right side to reveal a hidden sidebar navigation. 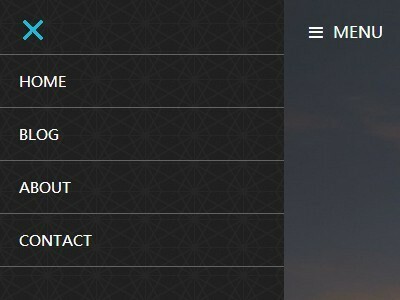 Just a simple jQuery script to create a fixed off-canvas menu that slides in from the left side while the main content slides to the right when activated. 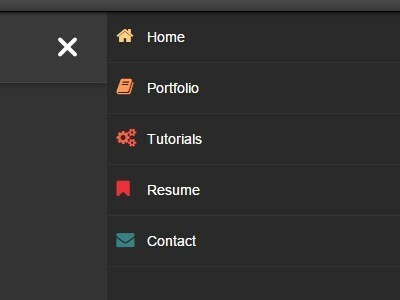 A jQuery & CSS3 based off-canvas navigation menu that pushes the main page to the right when toggled. Ultimate Burger Menu is a jQuery mobile menu resolution to create a responsive & animated dropdown menu or side push menu on your responsive designed website. Pushy is a lightweight jQuery plugin for creating mobile App-style push & slide menus that slide out from any sides of your screen when toggled. A nice and robust jQuery plugin for creating a mobile App-style responsive off-canvas sidebar navigation that is easily customizable and styleable.